This chapter provides an operational definition of, “effective communication,” that instructors and scholars can utilize to measure successful online graduate course pedagogy strategies. There is not a drought of research on online graduate courses, including studies that focus specifically on communication within the online environment. However, in this chapter a detailed analysis from aggregated research was performed in order to offer new knowledge and insight on how to successfully increase effective online graduate student communication. By the end of this chapter, several questions will be answered: What online instructional technologies do instructors utilize in online graduate courses? What assignments and activities do instructors include in online graduate course curriculum? What level of social presence helps create a learning environment that facilitates effective online graduate communication? The sheer multitude and variability of online communication platforms and instructional systems offer numerous research opportunities for scholars in the education discipline. Critics and proponents of online instruction have debated on the affordances and challenges of online education courses—especially in higher-level education programs given the increasing number of online graduate programs in the academia. While there is not a drought of research on the effectiveness of online graduate teaching and instruction, few studies have integrated the optimal course activities, technologies, and social environment of successful online graduate programs in order to inform the pedagogy strategies of those in the academia. There are many pedagogical strategies for eliciting effective communication among graduate students in online programs, both for student-to-student communication as well as instructor-to-student communication. What is effective communication? 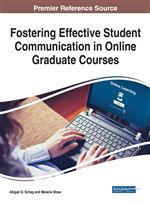 Effective is a vague term when referring to not only graduate student communication with one another and with the instructor, but also when referring to online communication as there are many different mediums for which communication can take place. For the purpose of this chapter, effective communication will be defined as that which elicits one or more of the following: increased student participation in online discussions, critical thinking and thoughtful, meaningful student responses, successful student collaboration to meet goals or complete assignments, and lastly, successful learning outcomes from students. The latter being the ultimate goal of effective communication, and that of any university-level, educational course. Effective communication is a prerequisite for learning and advancing one’s knowledge, as well as for preparing students to perform knowledge work on collaborative teams. While using prompts and online discussions have all but been exhausted, it is one method to provoking critical thinking discussions, as well as encouraging new questions and creating a body of knowledge from which students can draw from, learning from one another and the instructor as questions are asked, answered, and expanded on. Most online graduate courses almost always comprise of online discussions and/or prompts from the instructor that require students’ responses. Despite new technologies, such as Scalar and Twine for which to create interactive projects and educational material, the written word and critical thinking skills are the most valuable and required skills to be developed for all levels of students. One only strengthens skills by practicing and doing that which they are trying to improve, which is why online course discussions and responding to instructor’s prompts are still one of the most effective pedagogical strategies for fostering communication among students and the instructor in online graduate programs. The purpose of this chapter is to perform a detailed analysis of online instructional technologies, graduate student communicative activities, and instructional design and development of online graduate courses in order to provide specific, strategic pedagogical strategies for fostering effective communication in online graduate courses. What social and instructional activities are most effective; what instructional tools or other technologies are viable; and what level of social presence helps create a learning environment that elicits positive learning outcomes? The answers to these questions will help fuel future research and current online graduate course instruction, as well as better prepare students for the knowledge work that is the most significant workforce product today.